With 4 luxury trains offering a total of 15 signature rail journeys across some of the most exciting destinations across India, luxury train vacations are class apart when it comes to unique guest experiences in India. 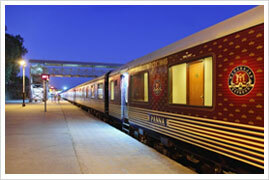 Luxury train traveling in india is a hassle free, sophisticated and opulent way to discover the myriad hues of India. 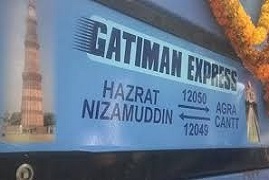 Each of these great rail journeys in India offer unique insider experience and cultural interactions at various destinations. 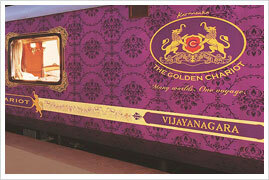 Luxury Trains in India are Palace on Wheels, Maharaja Express, Deccan Odyssey, Golden Chariot. Interiors characterized by seamless fusion of traditional motifs and modernity create ethereal travel ambience on board. Equipments such as live television, Wi-Fi internet, guest cabins with attached bathrooms, dining cars, bar and observation lounge add to the romance and opulence of these quintessential rail journeys in India. All inclusive trip, impeccable service and tastefully crafted pre-packaged itineraries combine together to make these opulent rides very special experience of a lifetime. 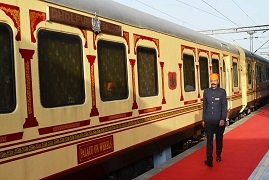 The latest luxury train offering in India, Maharajas Express is considered to be the India's answer to the Orient Express of the West. 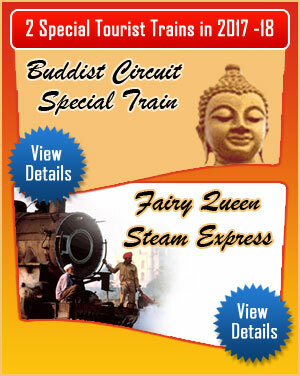 Flagged off in 2010, Maharaja Express offers 7 pan-Indian itineraries crisscrossing across some of the most fascinating terrains in India and covering some of the most prominent tourist destinations across India. Pristine beaches, wildlife parks and astonishing architectural and World Heritage sites along with cultural immersions & insider experiences: The Golden Chariot luxury trains travel in India is about this and more. When the idea of traveling to Rajasthan strikes the mind, the thought of exploring everything on a luxury train follows naturally. 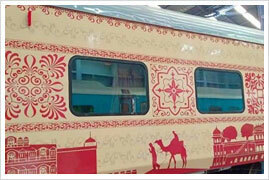 Falling in the category of luxury trains of India, comes this new entrant, Majestic Rajasthan Tourist Train. 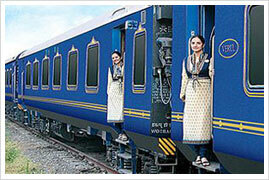 Serving some real fancy treatment to guests, this luxury train by IRCTC offers two journeys, where one outlasts the other.